Dr. Douglas Fulnechek discusses the different states of a disease process at an off-line carcass disposition correlation station. FSIS is the largest employer of veterinarians in the United States, consisting of 1,100 dedicated Public Health Veterinarians (PHV) who are trained in public health and regulatory medicine. These veterinarians verify the health of the animals destined for the food supply. Dr. Douglas Fulnechek is one of these veterinarians. For the last 15 years, he has worked as the senior FSIS official at a chicken slaughter and processing establishment in Springdale, Ark. As a PHV, he leads a 30-member team of supervisory consumer safety inspectors who verify that the products from the 250,000 chickens that the establishment slaughters and processes each day are safe, wholesome and correctly labeled and packaged. The work that Dr. Fulnechek and his team do is at the core of FSIS’ mission as a public health agency. Dr. Fulnechek earned his Doctor of Veterinary Medicine degree from Oklahoma State University. He began work as an associate in a mixed animal practice, bought his own veterinary clinic in 1982 and worked for the Kerr Foundation’s brucellosis education project. He began his career with FSIS in Springdale and served as a Supervisory Veterinary Medical Officer with assignments in about 40 establishments. He has authored a number of publications and was a member of the Blue Ribbon Task Force that authored, “The Future of FSIS Veterinarians: Public Health Professionals for the 21st Century.” Because of the task force, the working title of veterinarians in FSIS was changed to Public Health Veterinarian to reflect their role in protecting the public from foodborne illness. From 2007-2009, Dr. Fulnechek served as President of the National Association of Federal Veterinarians and will begin a second term as President in 2013. It is admirable that you and your team help protect public health everyday. This is the job that all of us in FSIS have taken a vow to do. That being said how will your team and many inspectors across the nation protect the public if the Modernization of the Poultry Industry is implemented. This will leave untrained plant employee's to perform our jobs thereby not protecting the public as we all took a vow to do. Many Inspection personnel across the nation will not have a job due to being either moved to another location or quitting because they have a choice of either move or leave. This is sad that FSIS has come to help industry make money instead of protecting the public health. Well Howard Farmer, As it was stated to me one day when I was an online inspector, now an offline inspector is that its what we can't see that will sicken us not what we can see. 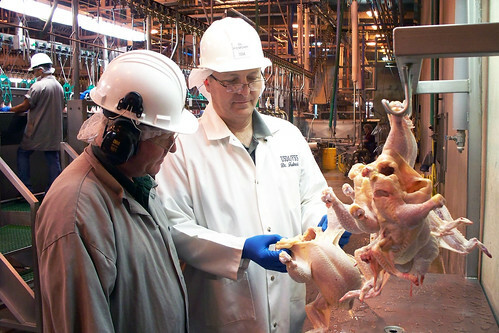 There are already inspectors trying to promote out of poultry inspection because they fear losing their jobs, many of the online inspectors are older and have 20 plus years in the agency so there will be many retire. FSMA is the main reason I applied for any and all promotions that opened just so I could hopefully keep my job with USDA.